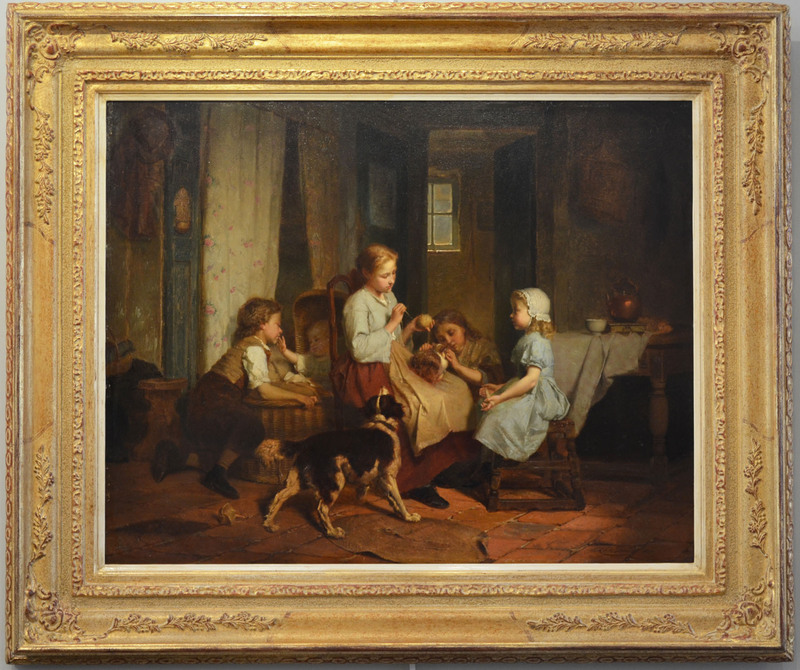 This is a very fine original oil on panel painting by Belgium artist Theodore Gerard (1829-1895) This interior scene of a mother and her children is titled: "Tea", the painting is signed "The Gerard, 1865" in the lower right corner. The painting measures 22X28 inches. On the back of the panel is written: "'The. Gerard Je soussigné déclare que le tableau ci conte est original. Bruxelles Décembre 1865.' 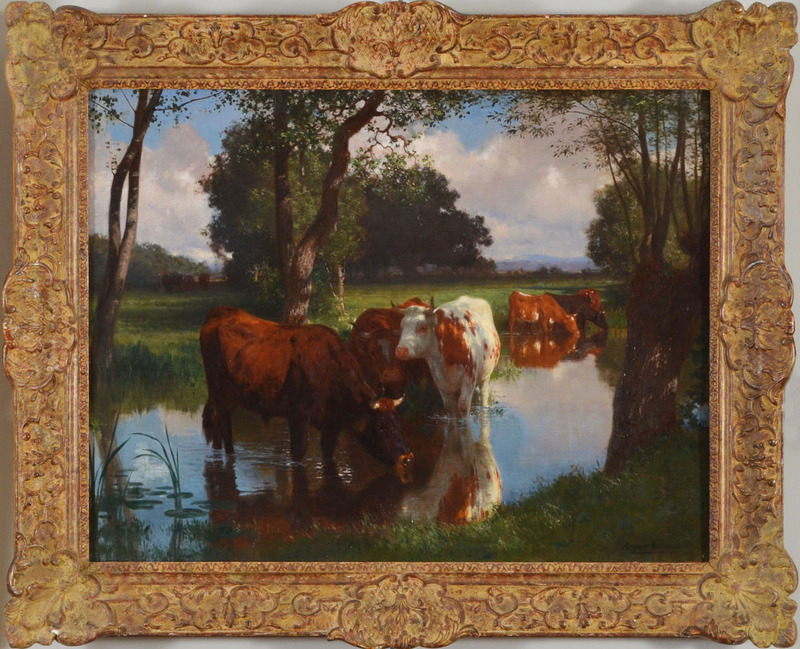 , it translates to Gerard 1, the undersigned declare that this work is original Dec. 1865" The painting is in a modern custom frame. 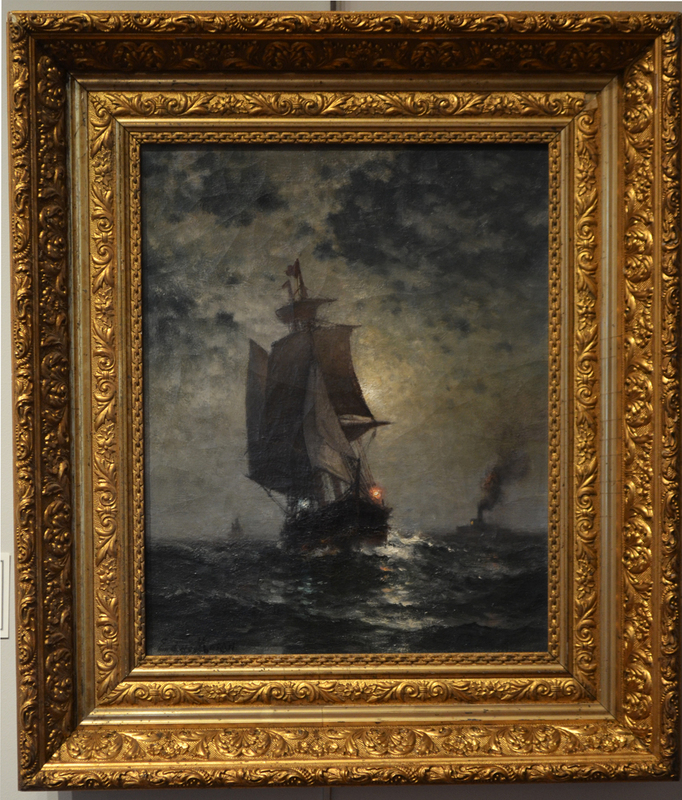 Theodore Gerard was an engraver and painter of genre scenes. He traveled throughout Germany, Austria and Hungary, but settled in Brussels in 1863. He taught painting at the Academy of Fine Arts in Brussels. He was awarded medals at exhibition in Philadelphia (1870), London (1871), Vienna (1873) and Brussels (1875). 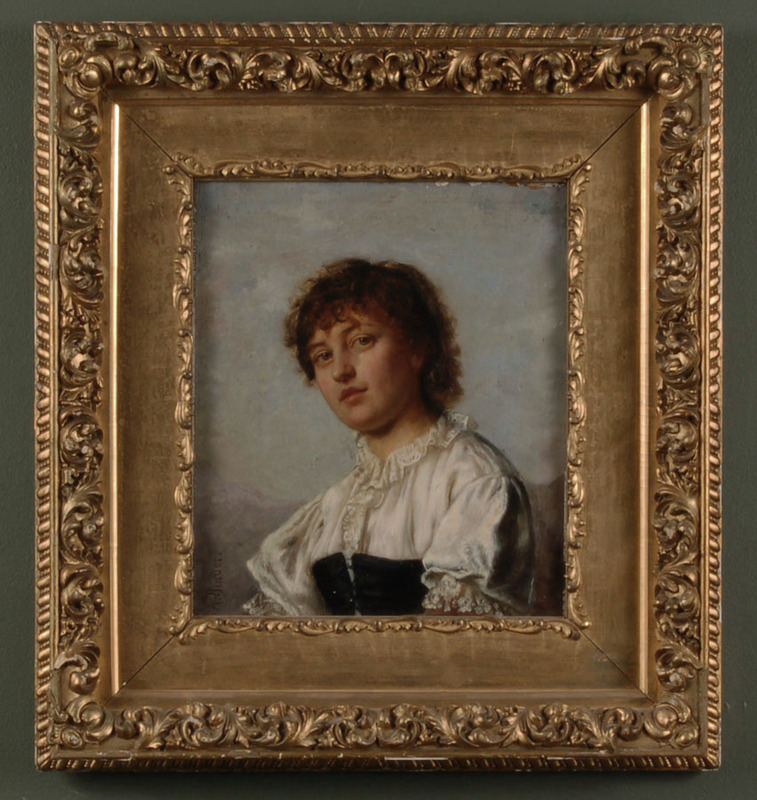 Oil on panel, 11 x 16 inches, cradle backing, signed lower right, in an ornate period gilt frame. A very well regarded artist of the French Realism movement, Emile Lambinet was born in Versailles and studied with Horace Vernet and John Baptiste Camille Corot. 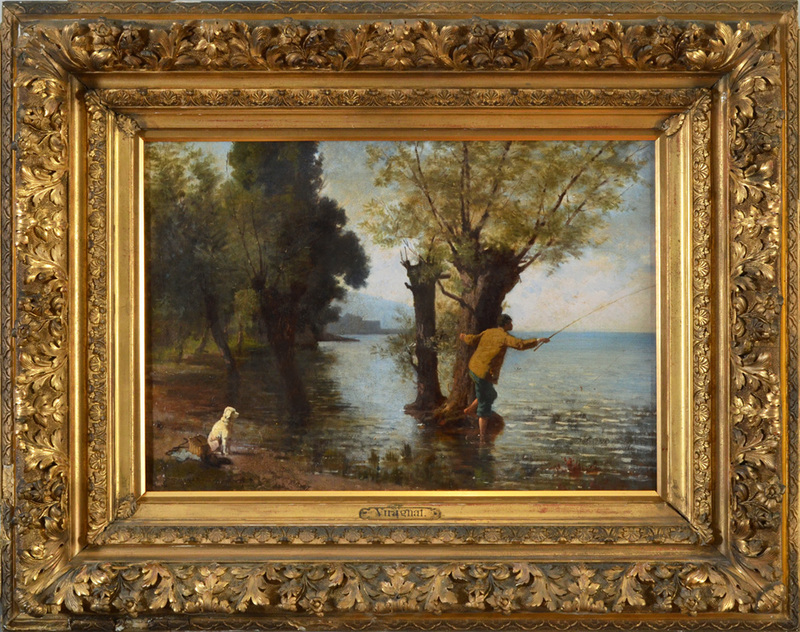 Both of these artists greatly influenced Lambinet's mature style of painting, as can be seen in this image, with the exacting details and bright atmosphere of Vernet and the subtle color palette with just a few accents of saturated color of Corot. Lambinet showed his work regularly at the Paris Salon, winning medals in 1843, 1853 and 1857, and in 1867 was made a Chevalier of the Legion de'Honnuer. 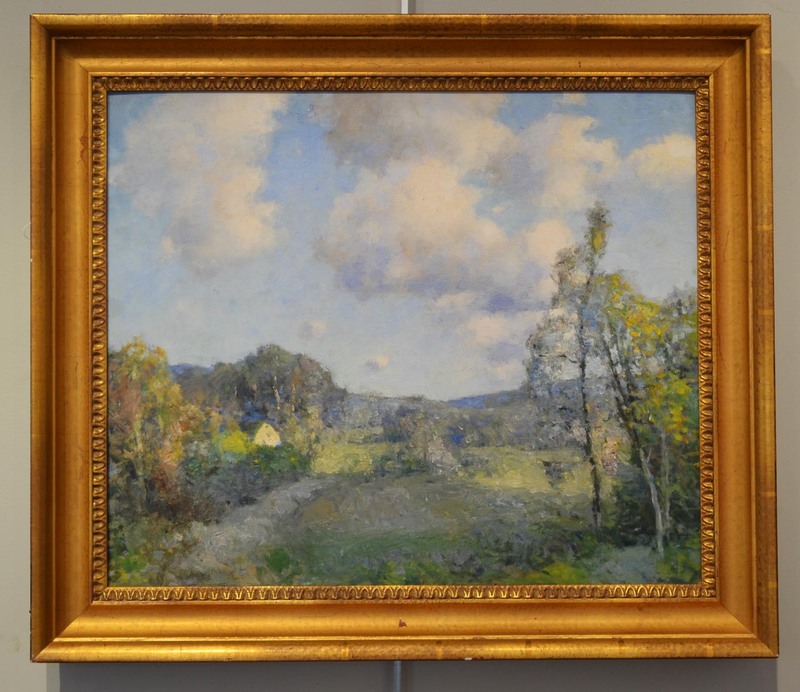 Today Lambinet's paintings can be found in many museums worldwide, with the largest collection of his work at the Musee Lambinet in the artist's hometown of Versailles. 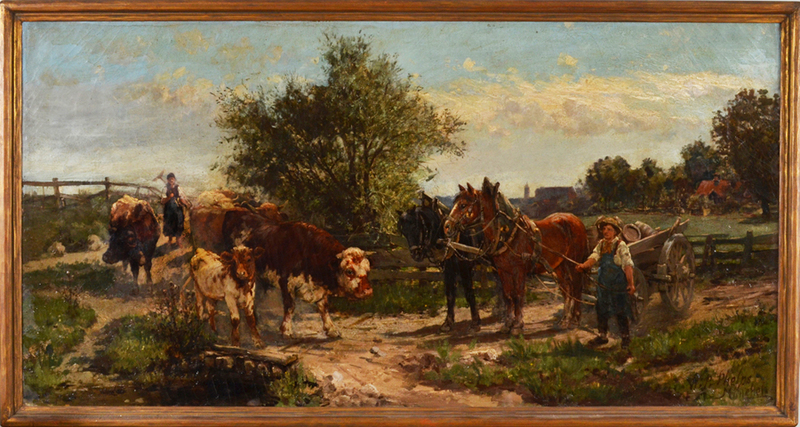 Oil on canvas, sight size 9 1/4 x 15 1/2 inches, c. 1900, signed l.r., inscription on the back reads "Near Aber, North Wales". This is a beautiful landscape with a shepherd and his sheep set against a majestic mountain background, in an ornate period frame. 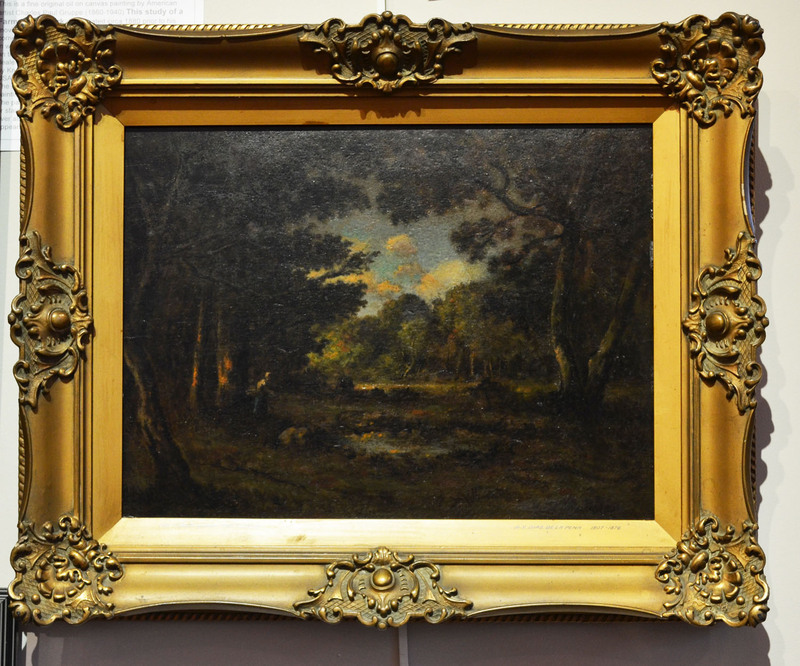 John Fullwood exhibited at the 1877 Royal Birmingham Society of Artists Show. The Royal Birmingham Society of Artists, established in 1821, was highly influential during the Pre-Raphaelite and Arts and Crafts periods. Its members included some of the most significant figures in English art, and presidents during the period included artists of the stature of Edward Burne-Jones, William Morris, John Everett Millais, Frank Brangwyn, and Lord Leighton. Edward was known for his silvery tones and loose accents of light. He developed a style based primarily upon English painting of the seventeenth and eighteenth centuries and seventeenth-century Dutch painting. 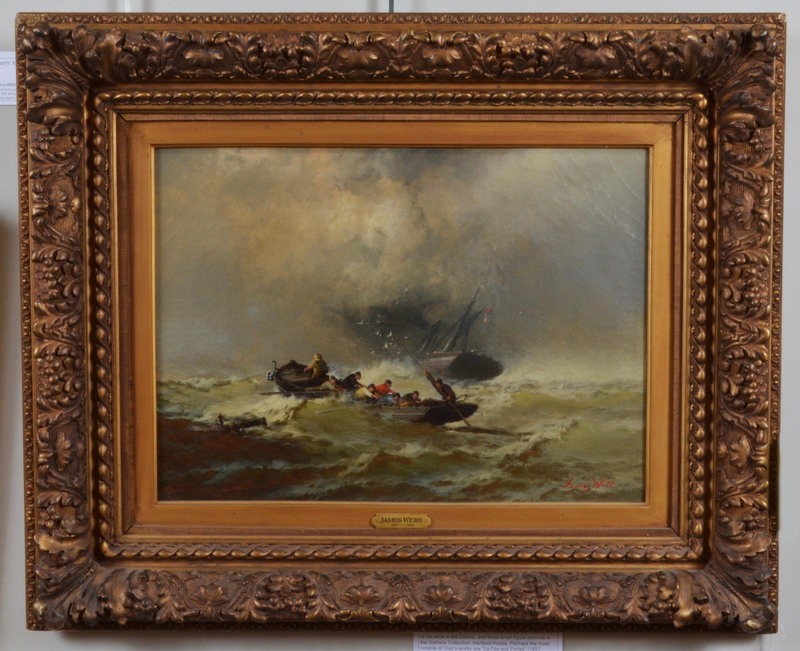 Edward Moran's forte was seascapes. His Hints for Practical Study of Marine Paintingwere published in issues of Art Amateur in 1888, and reflected his expertise on the subject. A beautiful combination the darkness of the sea at night with the rising moon just behind. 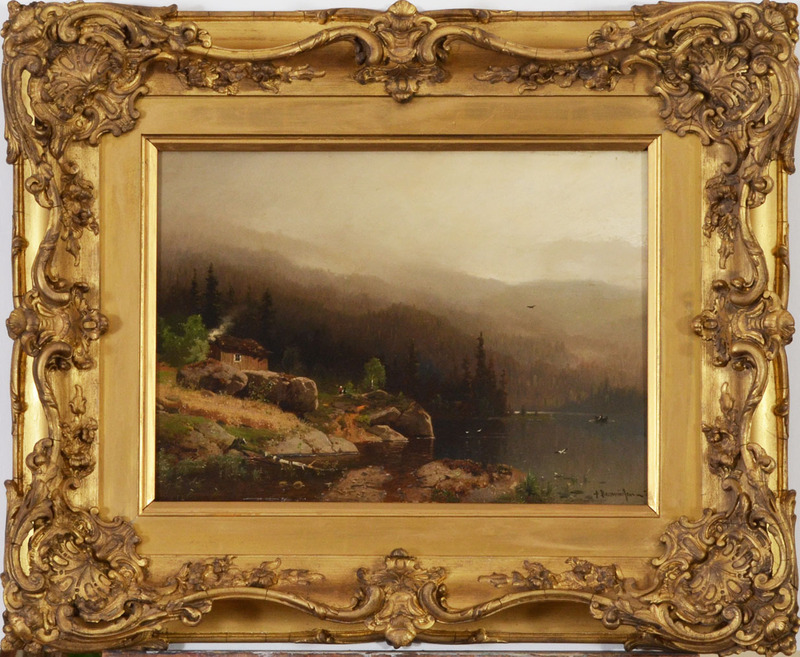 This is a very fine original oil on board painting by New Hampshire artist William Jurian Kaula. 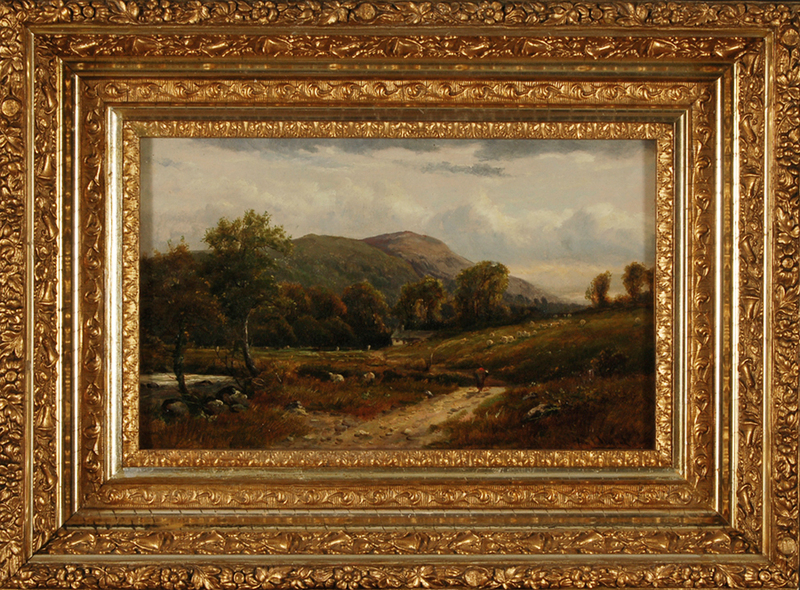 The title is: "New Hampshire Landscape,Spring". circa 1930 this painting has an image size of 19X22 1/2 inches. Housed in a tasteful modern frame. This painting came to us with a label on the back, this painting was in the collection of Minette Hunsiker Cummings, the artists niece. The painting is signed lower right corner. "William J. Kaula studied in Boston and Paris before establishing studios in Massachusetts and New Hampshire. 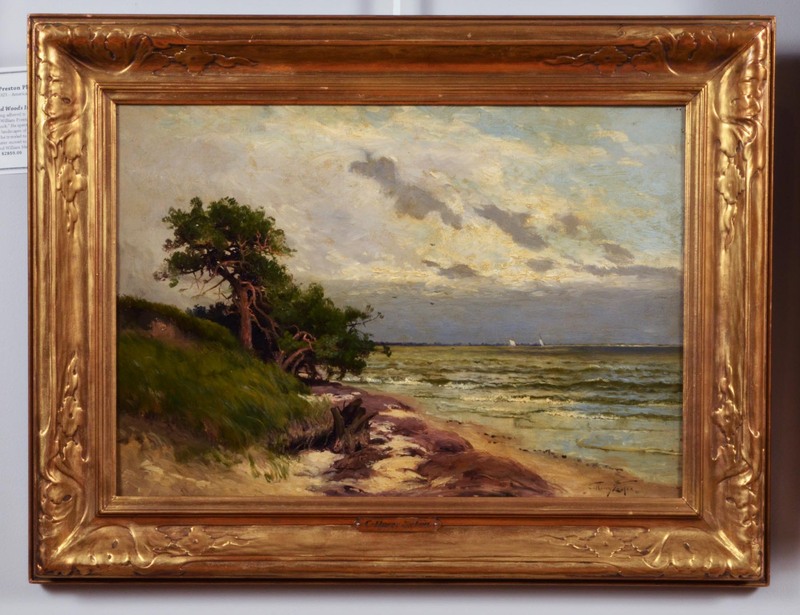 His wife, Lee Lufkin Kaula, was also a painter, and together they spent several summers in the countryside sketching. His paintings show atmospheric landscapes in cool colors and often emphasize dramatic cloud formations. (Smithsonian)"
This is an original oil on canvas painting by American artist Charles Harry Eaton. It is a fine costal view with sailboats on the horizon. 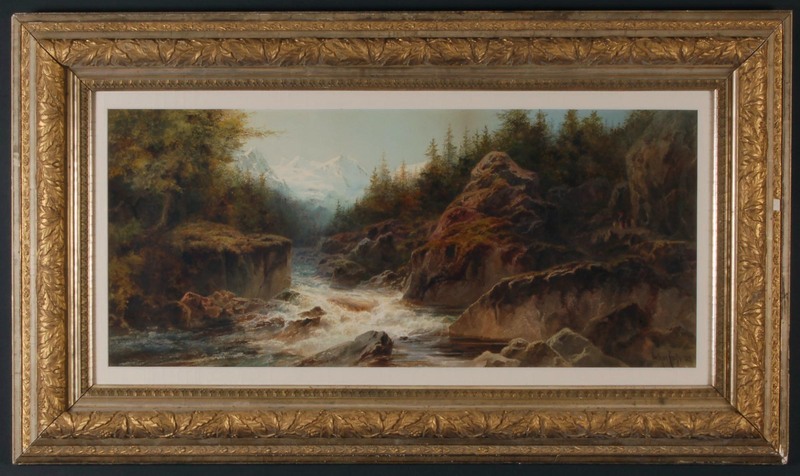 This painting measures 14X20 inches and is in a fine newcomb macklin carved picture frame. It is signed lower right corner. A fine expressive costal view by this well known New York artist. This is an incredibly detailed, atmospheric Norwegian landscape of a small cabin at the edge of a fjord, the distant hills fading into a soft morning mist. 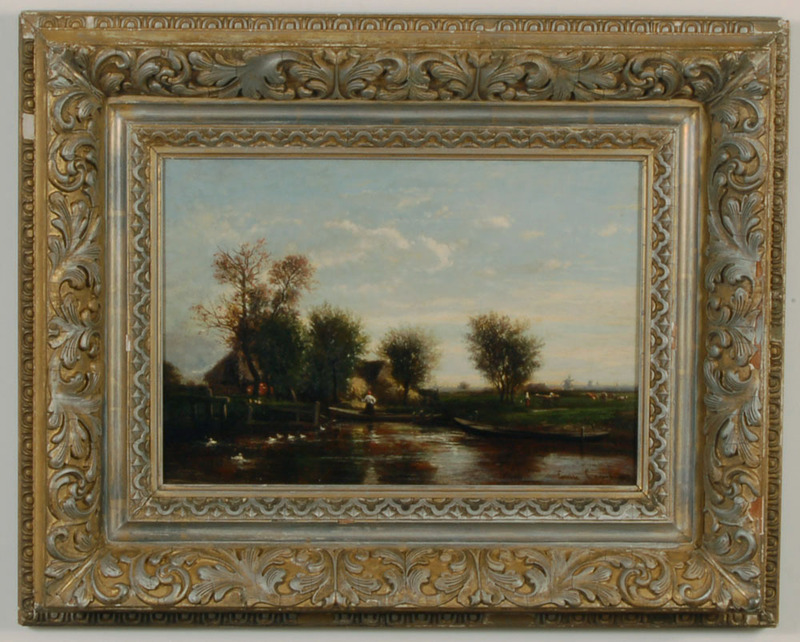 It is painted in oil on panel, 11 x 16 inches, 1871, clearly signed "A Rasmussen 71" in the lower right corner, in an ornate period gilt frame.